Because Motherhood Isn't Just a Job. It's a Calling. A mother's day is packed with a multitude of tasks that require energy and time: preparing meals, washing clothes, straightening and cleaning the house, and caring for children. These jobs all are necessary and crucially important. But in the dailyness of providing for a child's physical, emotional, and social needs, vital opportunities for spiritual nurture and training can be overlooked. - Make Life's Mundane and Nitty-Gritty Moments Work for You and Not Against You. - Discover Ways to Make Character-Building a Natural Part of Live. - Teach Your Child in the Same Way Jesus Taught the Disciples. - Pass on Crucial Gifts that Will Serve Your Family for a Lifetime. 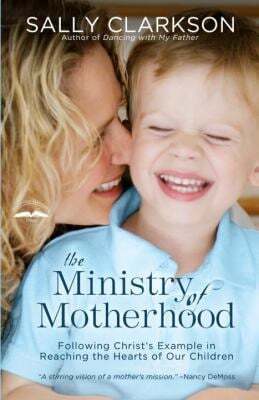 Using biblical wisdom and practical teachings, Sally Clarkson shows how you can make a lasting difference in your child's life by following the pattern Christ set with his own disciples-a model that will inspire and equip you to intentionally embrace the rewarding, desperately needed, and immeasurably valuable "Ministry of Motherhood.